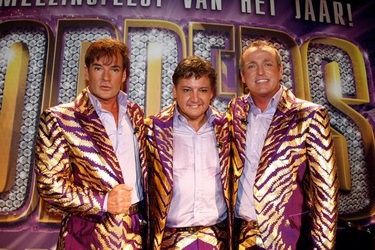 In 2005 popular Dutch singers Gerard Joling (ESC 1998), Rene Froger and Gordon (Dutch NF 1990 and 2003) have decided to start joke concert act, titled De Toppers. 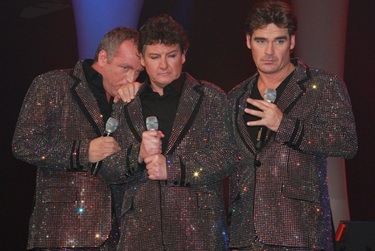 It first appeared on stage during Froger's concerts in 2004 in the Amsterdam Arena, where Joling and Gordon had guest appearance. The act appeared to be a great success. In 2005, there were two (sold out) concerts, three concerts in 2006, six concerts in 2007, and three concerts in 2008. More than 850,000 people enjoyed these shows in The Amsterdam Arena and more than 1,500,000 CDs and DVDs sold (all charting in the top 3 in charts). 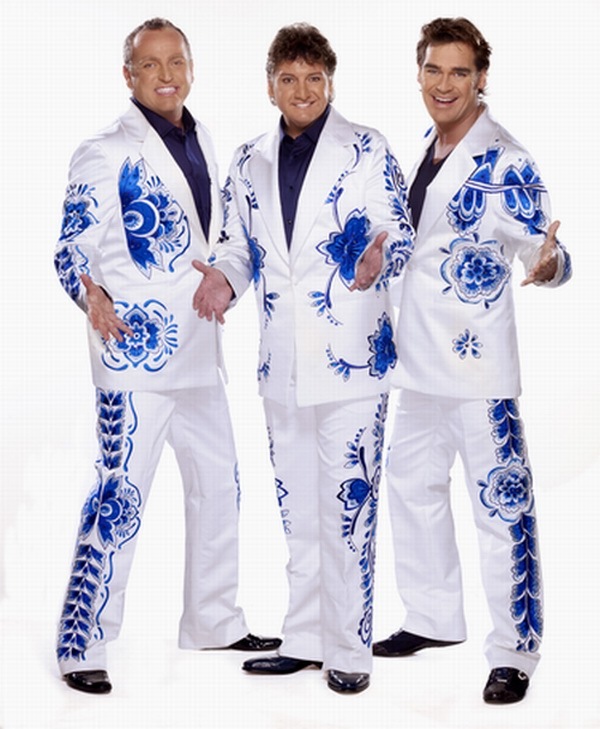 Repertoire of the trio consists mainly of covers of classics from home and abroad, such as Andre Hazes, Golden Earring and ABBA. 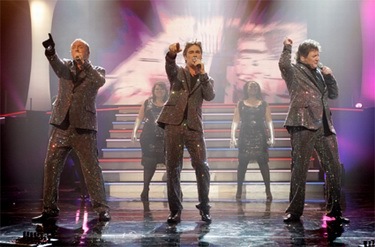 Sometimes, the full songs were sung and sometimes they were incorporated into medley's, usually with a theme, including an annual Eurovision Song Contest Medley. 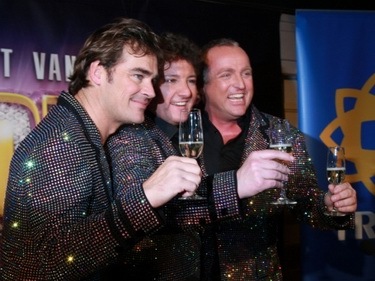 Due to the contract obligations and internal clashes in the trio, for Eurovision project and 2009 concerts Gerard Joling will be replaced by Jeroen van der Boom. Cornelis Willem Gordon (Gordon) Heuckeroth was born in 1968 in the north of Amsterdam. Before he became a professional performer, Gordon worked as a salesman on the street market. At first it looked like it was not possible for him to have a career in music. He was turned down at the Soundmixshow and became ninth in the National Songfestival contest, with only one point more than George Davis, being tenth and last. But in 1991 Gordon broke through with his third single. After that, his successes were Kon ik maar even bij je zijn (1991), Omdat ik zo van je hou (1995), Never nooit meer (1999) and Can you feel it (2007). He has released 10 albums, last of which, A Song For You became Gold in 2008. Gordon participated in the Nationale Songfestival again in 2003 but finished second behind Esther Hart. 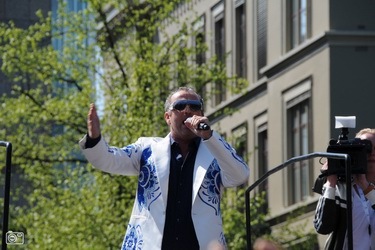 Gordon is, besides singer and performer, also a radio and television personality. After a few stand in's on the Dutch radio channel Radio 538 he got his own show on the same channel. Later he moved to the radio station Noordzee FM. On television, Gordon was the host of shows like Gordons Late Nicht Show and Gordon's Life Style. Starting in August 2005, Gordon appeared on the television channel Tien. 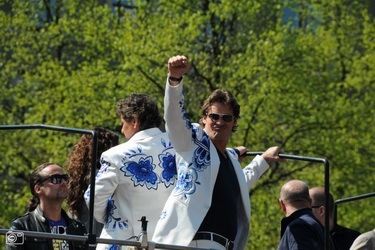 Together with his colleague Gerard Joling he did the show Joling & Gordon over de vloer. Gordon also appeared in the show Thuis and in 5 tegen 5. In the fall of 2007 Gordon started with his own show on the Dutch tv channel RTL 4 with Gillend naar huis. He also joined the jury of Idols Netherlands in 2007, together with John Ewbank, Jerney Kaagman and Eric van Thijn. He is now on his own radio show, Gordon on air! which started on November 3, 2007 on Radio538. In 2008 Gordon launched his new solo CD ‘A song for you’ with an ode to Donny Hathaway. In the meantime he also published his first book ‘Letterlijk leuk’, a collection of his columns which he wrote for a national newspaper and various magazines. Rene Froger was born on 5th of November, 1960. His father, Bolle Jan, had a cafe where Froger started performing. 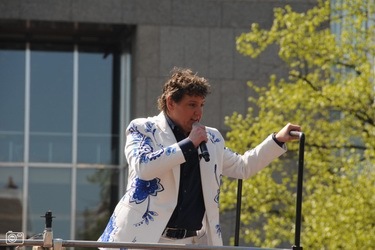 He began with Ted de Braak and Mini en Maxi and in 1987 he debuted with the single, Love Leave Me, but he was not very successful until his hit Winter in America was in Dutch Top 40, later his hit Alles kan een mens gelukkig maken, with Het Goede Doel was the number one of that list. His successful singles included Calling out your name, Why are you so beautiful and Here in my heart in 1993-1994, In dreams in 1996, Doe maar gewoon in 2007. He has released 19 albums, scoring 17 platinum (including 5 platinum awards for 1992 album Sweet hello's and sad goodbyes) and numerous gold awards. His regular concerts transformed into mega-events, like the ones in the Ahoy venue. 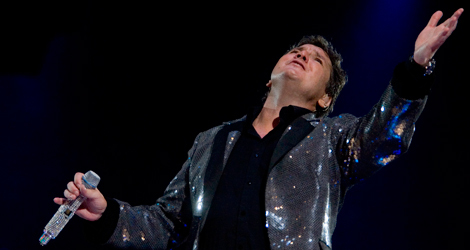 Renе was the first Dutch artist to do three consecutive sold out shows in the Kuip stadium. After his four stadium concerts in the Amsterdam ArenA in 2004, Rene committed himself for a few years to the intimacy of theatre. In the meantime he worked on a new musical adventure and launched his first Dutch album in 2007. The first single, taken from this album, stormed the Dutch charts. In 2008 Rene and his family where the stars in the weekly television soap ‘Effe geen cent te makken’. The television show was seen by more than 1,400,000 people per show. Jeroen van der Boom was born in Nijmegen, 22 June 1972. During his time as a student, Jeroen van der Boom was already an artist performing with a band The Travellers. In 1996, he was employed by SBS 6 as the presenter of the TV programme Real TV. After that, he also worked for the music show 15 Miljoen Mensen, Barney's Dart Show (with Raymond van Barneveld), and Domino Day. In 2002, he founded his own production company: Rebel-TV & Events. He played in several theatre shows, including Barcelona and Novomundo. Van der Boom regularly gave concerts in the Netherlands, and was eventually given the opportunity to record an album. This album featured cover versions of (amongst others) Don't Stop Me Now (by Queen) and Wonderful Tonight (by Eric Clapton). 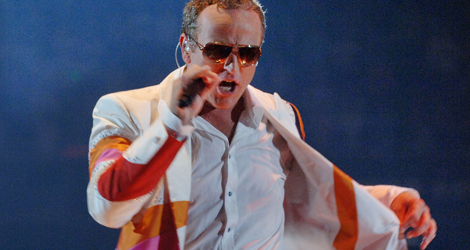 In 2007, he recorded a cover of Tom Jones's song She's a Lady, and was a supporting act during Jones's concert in the Heineken Music Hall on 21 April 2007. On 18 June 2007, his single Jij bent zo (a cover of David Bisbal's Silencio) was released. It unexpectedly became a huge hit, and rose to the first place on Dutch charts. On November 12, 2007 a new single was released, Een wereld. In december, this song went to the nr. 1 position in the charts, and remained there for two weeks. Jeroen did two sold out shows in the Heineken Music Hall in Amsterdam. One show in November 2007 and one in October 2008. He also starred in Lionel Richies ‘Symphonica in Rosso’ in the Gelredome Venue in Arnhem. 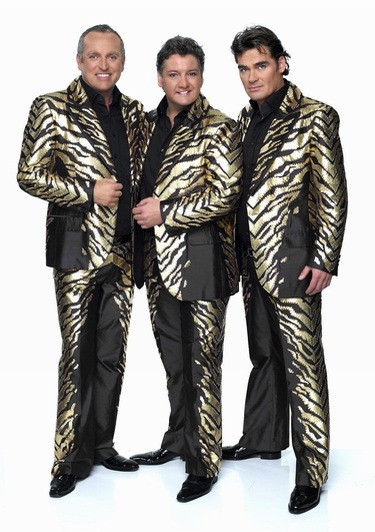 At Eurovision trio will perform song "Shine" Ger van de Westelaken and produced by Bas van den Heuvel. Bas was one of the songwriters of Dutch 2008 entry, while Ger is pseudonym of Gordon. At the press-conference that followed the selection, Gordon told emotional story of song creation: "I have experienced a lot during last couple of monthes. First, Gerard left the band. Also, my health condition is in a bad shape, I was released from hospital only earlier this week. I wrote this song on a rainy October morning, trying to forget all difficulties. I hope this song will bring positivity and happiness to people". Band also informed that they will release winning song as single and plan to attend several foreign national selections as guests. "Trust us, we will catch eyes of everyone in Russia", added Gordon. You can watch the national selection again here. Official video for the song is available here. Listen to the final version (low quality file) here. В 2005 году популярные голландские певцы Герард Йолинг (участник Евровидения 1998), Рене Фрогер и Гордон (участник отборов 1990 и 2003) решили создать юмористическую концертную группу, дав ей название De Toppers. Первое появление Топперов состоялось во время концерта Фрогера в 2004 году в Амстердамской Арене, где к нему присоединились Йолинг и Гордон. В 2005 году, группа проводит два (аншлаговых) концерта, три в 2006м, 6 в 2007м и три в 2008м. Более 850 000 зрителей наблюдали за этими шоу в Амстердам Арене и более полутора миллионов CD и DVD с их записями были проданы (все вошли в топ 3 чартов). Репертуар трио в основном состоит из классических песен, как местных, так и зарубежных, например Андре Хазеса, Golden Earring и ABBA. Иногда исполнялись полные песни, иногда они объединялись в попурри, зачастую тематические, и обязательно включавшие ежегодное попурри на тему Евровидения. Из-за других контрактных обязательств и внутренних противоречий в группе на Евровидении и концертах 2009 года вместо Герарда Йолинга выступит Йероен ван дер Боом. Корнелис Виллем Гордон Хейкерот (Гордон) родился в 1968 году на севере Амстердама. До того, как он стал профессиональным певцом, Гордон работал в качества продавца на уличном рынке. Сначала казалось, что начать музыкальную карьеру ему не удастся. Его заявку отверглив в Soundmixshow, он занял только девятое место в национальном отборе на Евровидение, набрав лишь на балл больше последнего исполнителя, Джорджа Дэйвиса. Но в 1991 году с выходом третьего сингла наступил ожидаемый прорыв. Другими успешными синглами Гордона были Kon ik maar even bij je zijn (1991), Omdat ik zo van je hou (1995), Never nooit meer (1999) и Can you feel it (2007). Как певец он выпустил 10 альбомов, последний из которых, A Song For You, стал золотым в 2008 году. Гордон вновь пробовался попасть на Евровидение в 2003 году, но занял второе место после Эстер Харт. Помимо песенной карьеры - Гордон также известный радио и телеведущий. После нескольких попыток на радио 538 он получает собственное шоу на этом канале. Затем он переходит на радио Noordzee FM. На телевидении Гордон ведет такие шоу, как Gordons Late Nicht Show и Gordon's Life Style. С августа 2005 года Гордон появляется на телеканале Tien. Вместе со своим коллегой Герардом Джолинкгом он ведет шоу Joling & Gordon over de vloer. Гордон также появляется в шоу Thuis и 5 tegen 5. Осенью 2007 года Гордон стартует собственное шоу на телеканле RTL 4. Он также входил в состав жюри Идола 2007 вместе с Джоном Эвбанком, Джерни Каагманом и Эриком ван Тийном. C ноября 2007 года ведет радиошоу Gordon on air! на радио 538. В 2008 году свет увидел новый альбом Гордона "A Song for you", в который вошла ода Донни Хатавею. В тоже время, Гордон также выпустил книгу "Letterlijk leuk" - коллекцию колонок, которые он вел в различных газетах и журналах. Рене Фрогер родился 5го ноября 1960го года. Его отец, Болле Ян, был владельцем кафе, где Фрогер начал свои выступления. Дебютировал Фрогер с синглом Love Leave Me, но его первым настоящим хитом стала песня Winter in America, которая вошла в топ 40 голландских чартов. Далее его песни Alles kan een mens gelukkig maken, и Het Goede Doel возглавили этот хит парад. Среди других успешных песен - Calling out your name, Why are you so beautiful и Here in my heart в 1993-1994, In dreams в 1996, Doe maar gewoon в 2007. Он выпустил 19 альбомов, собрав 17 платиновых (включая 5 платин за альбом 1992 года Sweet hello's and sad goodbyes) и многочисленные золотые премии. Регулярные концерты Рене становились мега-событиями, например его выступления в Ахой-арене. Рене стал первым голландским артистом, проведшим три аншлаговых концерта на стадионе Куип подряд. После 4х концертов на Амстердам Арене в 2004 году Рене посвятил себя на несколько лет театральной корьере. В то же время он продолжал работу над новым альбомом, и его первый альбом на голландском языке увидел свет в 2007 году. В 2008 Рене и его семья приняли участие в еженедельном шоу "Effe geen cent te makken", за каждым выпуском которого следило более 1 400 000 зрителей. Йероен ван дер Боом родился в Ниймегене 22го июня 1972 года. Он стал выступать с группой The Travellers уже учась в институте. В 1996 году он становится ведущим шоу телеканала SBS 6 Real TV. После этого он работал на шоу 15 Miljoen Mensen, Barney's Dart Show и Domino Day. В 2002 году он основывает собствунную продакшн-компанию: Rebel-TV & Events. Он играл в различных театральных постановках, включая Barcelona и Novomundo. Ван дер Бооб регулярно давал концерты в Нидерландах и наконец приступил к записи первого альбома. На него вошли ковер версии песен Don't Stop Me Now (Queen), Wonderful Tonight (Eric Clapton) и др. В 2007 году он записал кавер-версию песни Тома Джонса She's a Lady и выступил у него на разогреве, во время концерта Джонса в Хайнекен Мюзикхолле 21го апреля 2007 года. 18го июня выходит его сингл Jij bent zo (ковер версия песни Давида Бисбаля Silencio). Неожиданно она становится большим хитом и занимает первое место в голландских чартах. 12го ноября выходит новый сингл - Een wereld. В декабре она также возглавляет чарты, где продержалась две недели. Йероен дал два аншлаговых концерта в Хайнекен Мюзик Холле в Амстердаме - в ноябре 2007 и октябре 2008 года. Он также принял участие в концерте Лайонеля Ричи "Symphonica in Rosso" в арене Гельредом в Арнхеме. В Москве De Toppers исполнят песню "Shine" Гера ван де Вестелакена, которую спродюсировал Бас ван дер Хеувел. Бас был одним из соавторов песни Голландии на Евровидении 2008, а Гер - это псевдоним Гордона. На пресс-конференции по окончанию концерта Гордон рассказал эмоциональную историю ее создания: "Я через многое прошел за прошлые пару месяцев. Сначала Герард ушел из группы. Мое здоровье тоже находится в плохом состоянии, только на этой неделе меня выписали из больницы. Песню я написал одним дождливым октябрьским утром, пытаясь забыть о всех трудностях. Надеюсь, что она сможет принести людям позитив и счастье". Группа рассказала, что выпустит сингл с победившей песней и планирует посетить в качестве гостей ряд национальных отборов. "Поверьте, в России мы сможем привлечь к себе всеобщее внимание". Посмотреть снова национальный отбор вы можете здесь. Официальный видеоклип на песню доступен здесь. Итоговую версию (файл низкого качества) вы можете услышать здесь. So open up you heart! Are you ready for a brand new start! To keep the World from going wrong! And all people will be reunited! Don’t forget about the role you must play! the World we all dream off! let your light shine, shine, shine, shine shine!! 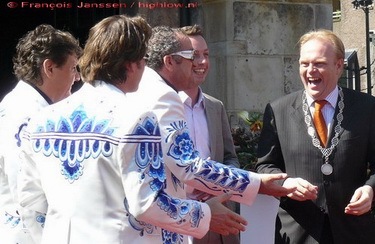 - Hello, De Toppers, and first of all our congratulations for being selected Dutch representatives at Eurovision 2009! What unites you, having successful solo careers, in De Toppers? - We are all music lovers and we love to sing for big audiences. We have the same humour and our combined love for the Eurovision Song Contest takes us to Moscow. - How do you feel now, being a Eurovision participants? What Eurovision means to you in general? - We are true fans of the Eurovision Song Contest and have been closely following the contest for years now. Our best memories of this event are mostly the cosy nights, when we were little boys, sitting with our family and watching the contest. With pen and notepad on their lap and a bag of chips close to us, we awarded points to each song to compare them afterwards with the points given by the jury. Jeroen has a very vivid memory of the time Sandra Kim won the contest for Belgium, in 1986. J: "I still remember I had a huge crush on her"
During our concerts the last four years, we brought many medleys of old and new Eurovision Song Contest-songs. Our participation is a dream coming true and an absolute mile-stone in our careers. We are enormously proud that we represent The Netherlands on the biggest music event of the world. And our trip to Moscow is going to be one big and -over the top- spectacle that no-one can ignore. - Was it difficult for you to part the ways with Gerard Joling? Have you been in contact with him recently? - Yes it was. He was a Topper for over four years so it was very difficult to part. In the end it was better this was and we are pleased that Jeroen is the new Topper. We spoke to Gerard shortly after the Dutch final of the Song Contest and he was very enthusiastic about the song Shine. - Jeroen, can you please tell us, how you were invited to join the trio? 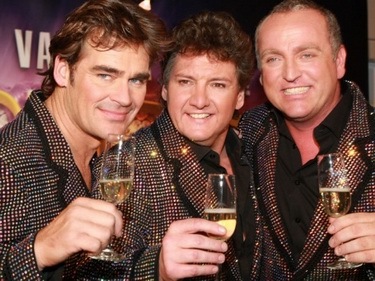 - Once it was clear that Gerard Joling left The Toppers Rene and Gordon called me to ask if I could join them. The answer wasn’t very difficult. - You just had an amazing song selection final, where you performed 6 songs. Which one was your personal favourite? - We had two personal favorites, "Shine" and "Angels of the Night", these were both fantastic songs! - How can you describe your song "Shine" in one phrase? - The message of the song "Shine" is that if you have a positive attitude we can all together solve nearly any problem. "You should be a source of love, support and relieve in times of concern and despair." It we tackle the problems in this world together in a positive manner and with an open vision we can achieve an resolve nearly everything. Let your light Shine! - Gordon, as you’re the man behind the song, can you tell shortly the story of it’s creation? - I wrote the song "Shine" early morning in October. To be more precise at 05.20 hrs am. I remember waking up with a melody in my head and pieces of lyrics about a world filled with passionate people radiating with light. Immediately I was drawn to my computer and thinking about Rene, Jeroen and myself it was like a higher power dictating me. Together with producer Bas van den Heuvel we fine-tuned the song later that day and "Shine" was born. - Getting trough to the finals and win! - We definitely are planning this. Hopefully we can record them very soon. - Yes we are, we already got interview requests from the BBC and Moldova. We think that it is very important to do a promotional tour so that the international audience gets to know us, and we get to know the audience. - Do you already have some plans for the video for the song? - Yes we have. We are going to film it today (05.02) actually and we are hoping for a very nice video. - De Toppers soap is much awaited by Dutch fans. Can foreign fans also expect something interesting from it? - Yes they can. We will put them on You Tube and on the Dutch Eurovision site so that everyone can see them. It will give audiences the change to see what amount of work it takes to compete at the Eurovsion Song Contest. - Will the stage presentation be similar to the one at the Dutch Songfestival? Will same backing vocalists accompany you in Moscow? - Sort of. In Moscow it will all be bigger! And yes, we will take our backing vocalists with us. - We think that the song and the performance itself is the most important. Look at the previous top 5 finalists and you can see what we mean. - No we don’t. Again, when you look at the previous top 5 finalists you can see that there is no such thing as a political contest. It all depends on the song and the performance. - Addition of jury voting this year – a welcome change? - Definitely. It is always important to get a professional jury to come in. We think it gives extra credit to the whole. - Yes and we already have. To us it is very important to know what our competition will be, and so far it is going to be hard! - How are you planning to "Shine" in Moscow? Can fans expect a lot of partying in Euroclub with you? - Yes they can! 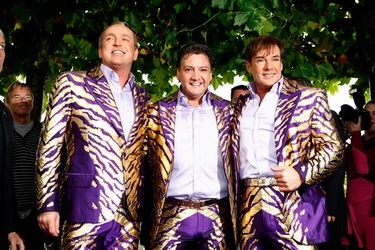 The Toppers are famous for their over the top appearances. We are planning to wow Moscow! 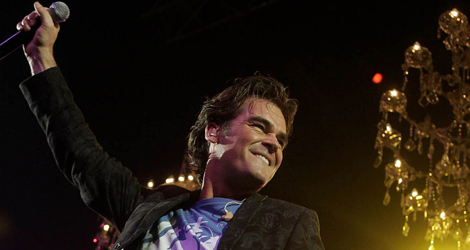 - De Toppers in Concert later in Summer – any big surprises awaiting us there? Any plans as trio after it? - We cannot tell to much about the content of the shows this Summer. As always it will be big and over the top with awesome international guests. Of coarse we are already planning concerts for 2010. - We hope to meet most of you in Moscow and we hope you enjoy our song and performance. And finally please vote for us! - Thank you for the interview, good luck with your preparations and see you in Moscow! - Привет, De Toppers! Наши поздравления с тем, что вы стали представителями Нидерландов на Евровидении 2009! Что объединяет вас, таких успешных соло исполнителей в De Toppers? - Мы все очень любим музыку и обожаем петь перед большими зрительскими аудиториями. Мы разделяем общее чувство юмора, и наша общая любовь к конкурсу Евровидение - это то, что ведет нас в Москву. - Как вы ощущаете себя сейчас, став участниками Евровидения? Что Евровидение означает для вас в общем? - Нас можно считать настоящими фанатами Евровидения - мы следим за шоу уже многие годы. Наши лучшие воспоминания о нем - это вечера, когда мы, в детстве, смотрели конкурс с нашими семьями. С ручкой и блокнотом и пачкой чипсов рядом, мы оценивали все участвующие песни, чтобы потом сравнить наши баллы с баллами, которые давало жюри. А вот Йероен, например, вспомнит прежде всего победу Сандры Ким в 1986 году. Й: "Да... я до сих пор помню, я безумно в нее влюбился"
Во время наших концертов за последние четыре года мы исполняли множество попурри старых и новых песен Евровидения. Для нас участие в конкурсе - это воплощение мечты и очень большой этап в наших карьерах. Мы невероятно гордимся тем, что мы будем представлять Нидерланды в крупнейшем музыкальном мероприятии в мире. И наша поездка в Москву станет таким большим, даже черезчур большим! спектаклем, который никто не сможет пропустить. - Тяжело было вам расстаться с Герардом Йолингом? Общались ли вы с ним в недавнее время? - Да. Он был Топпером более 4х лет, поэтому расстаться было очень тяжело. Но случилось то, что случилось и мы очень рады, что Йероен стал новым Топпером. Мы общались с Герардом после национального отбора и он с большим энтузиазмом отозвался о нашей песне. - Йероен, расскажи нам, как ты присоединился к трио? - Когда стало ясно, что Герард ушел, Рене и Гордон позвонили мне и предложили присоединиться к ним. Ответ был не слишком сложным. - Вы только что провели потрясающий финал, где исполнили 6 песен. Какие из них были вашими фаворитами? - Их было два - "Shine" и "Angels of the Night" - обе - просто фантастические песни. - Как бы вы описали вашу песню "Shine" в одной фразе? - Месседж песни "Shine" в том, что если вы сохраняете позитивное настроение, мы вместе сможем разрешить почти любую проблему. "Ты должен быть источником любви, поддержки и помощи во время трудностей и испытаний". Если мы будем вместе бороться с мировыми проблемами, сохраняя подобный позитивный подход, то мы сможем разрешить почти любой вопрос. Пусть сияет ваша любовь! - Гордон, как автор расскажи нам историю создания этой песни? - Я написал "Shine" одним октябрьским утром. Если точнее - то было 5.20 утра. Я помню, что проснулся и в моей голове уже вертелась мелодия и части текста, о мире, наполненом людьми, излучающими свет. Немедленно я сел за свой компьютер и подумал о Рене, Йероене и мне, это было как будто мне диктовала какая-то высшая сила. Вместе с продюсером Басом ван ден Хеувелом мы доработали песню в тот же день, так и появилась "Shine". - Пройти в финал и победить! - Да, мы обязательно этим займемся. Надеемся, что в самое ближайшее время. - Да, мы уже получили приглашения от BBC и Молдовы. Мы думаем, что это очень важно, поскольку так зрители смогут познакомиться с нами и мы сможем познакомиться со зрителями. - Вы планируете снять клип на вашу конкурсную песню? - Да. Кстати, именно сегодня (05.02) мы и будем его снимать. Думаем, что получится очень хорошее видео. - Документальный сериал о De Toppers весьма ожидаем голландскими поклонниками конкурса. Могут зарубежные фанаты ждать от него также чего-то интересного? - Да, могут. Мы будем выкладывать эпизоды на You Tube и на голландский сайт Евровидения, чтобы зрители смогли их посмотреть. Это даст шанс увидеть весь объем работы, которую требуется проделать для успешного участия на Евровидении. - Будет ли ваше сценическое выступление в Москве походе на то, что мы могли видеть в Songfestival? Поедут ли с вами те же бэк-вокалистки? - Ну, что-то вроде того. Но в Москве, конечно же, оно будет круче! И да, мы прихватим бэк-вокалисток с собой тоже. - Мы думаем, что песня и исполнение наиболее важно. Посмотрите на те песни, которые входили в пятерку на последних конкурсах и вы поймете, что мы хотим сказать. - Нет. Опять таки, если посмотреть на прошлые пятерки, станет ясно, что такой вещи как политика на Евровидении нет. Все зависит от песни и выступления. - Конечно. Всегда важно, чтобы оценивали профессионалы. Это придает больше доверия самому результату. - Да, и мы уже делаем это. Для нас очень важно оценить уровень конкурса, соперников, и, пока нам кажется, что схватка предстоит тяжелая! - Как вы планируете "зажечь" в Москве? Могут ли фанаты конкурса ожидать много тусовок с вами в Евроклубе? - Конечно же! Топперы известны своим выступлениями, которые, как говорится, "over the top". Мы планируем сделать так, чтобы поразить всю Москву! - De Toppers in Concert этим летом - ждут ли нас там большие сюрпризы? Есть ли уже дальнейшие планы трио после этого? - Пока мы не можем рассказывать о содержании наших летних концертов. Конечно, они будут крутыми, обязательно участие известных международных гостей. И мы уже планируем серию концертов на 2010 год. - Мы надеемся встретить большинство из вас в Москве, и надеемся, что вам понравится наша песня и выступление. Голосуйте за нас! 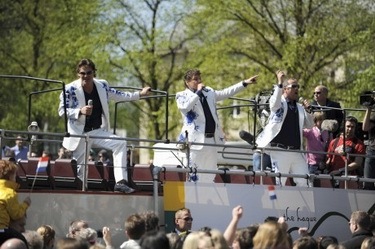 De Toppers invite all fans to see them off to Moscow, from 07.15 to 07.45 in departure hall 2 at KLM desk at Schiphol. Группа De Toppers приглашает всех поклонников проводить их в Москву - с 7.15 по 7.45 в зале вылета 2 в аэропорту Скипхол. On Saturday afternoon on the 18th of April 2009, The Toppers have welcomed 21 European delegations who will join the Eurovision Song Contest. First, on Saturday, the singers and bands met in The Hague. At the entrance to the "New Church" in front of City Hall they were greeted by Deputy Mayor Frits Huffnagel and members of the band The Toppers, who will represent the Netherlands in Moscow. "For us, it is unbelievably great honour to perform in Moscow - told RIA Novosti Jeroen van der Boom. - On hearing that we will be there to represent the Netherlands, we told each other: "We are very lucky to to go to the contest to such a beautiful city. "For us, it is - a real dream, and we look forward to its implementation. In Moscow we will perform the song "Shine", which шы about friendship, joy and happiness. In my opinion, this is the most important thing in life and songfestival . Of course, we are counting on success in Moscow, but in the competition there will be many strong performers, that great, and the victory is not so important. The main thing we are sure that we get great pleasure from the performances in Moscow. What place we will finish on, we'll depend on vote, and we hope that viewers and listeners will kindly support us. " "We'll enjoy our stay in Moscow, where we will bring a positive attitude and try to pass it to the audience - says, in his turn, Rene Froger. - The main idea of the song" Shine ": in times of anxiety and despair, be a source of love and light to help other people. If we are going to solve the existing problems in the world with openness and positive spirit, then together we can solve very many of them. " Froger reported that The Toppers rehearse a lot to make a good show for "Eurovision", and prepare a new costumes. "The main thing will happen in Moscow - he said. - Many participants are candidates for the winner's title. Among them are representatives from Russia, Norway, Great Britain, Spain and other countries." The singer from the UK Jade told RIA Novosti that she expects an exciting spectacle at Eurovision in Moscow. "I keep a secret details of my performance in the Russian capital, and I can only say that together with my partners, I am preparing hard for it: we have a lot of rehearsing, working on the production of our show, with clothes and props." After welcoming the participants and the press conference which attracted many journalists from all over Europe, the band has performed their entry Shine. Then all the participants at the three public buses travelled around The Hague. Along the whole way they were welcomed by citizen and tourists. At one of the central squares in front of Parliament they made a stop to communicate with the audience gathered there. The Dutch team directly from the bus once again performed their entry which was met with stormy applause. The end point of the route the world famous open-air museum "Madurodam" in which the most famous buildings in the Netherlands are presented in the reduced form - 1:25. The participants of "Eurovision" had the opportunity to look around and make photos. They also gave interviews to journalists who, on this occasion, were filming the famous singers and musicians in front of brilliantly executed miniature models. Tourists, visiting Madurodam also spoke with celebrities and ask for their signatures. On Saturday evening Eurovision from 21 country gave four-hour long concert in "Marcanti" hall that, holds around 2 thousand spectators. Some participants directly arrived from London to Amsterdam from the similar party held on Friday in UK. 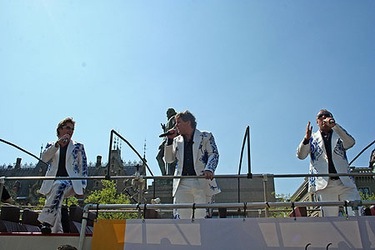 Because of solo obligations, The Toppers (Rene Froger, Jeroen van der Boom and Gordon) were not able to attend to ‘Eurovision in Concert’ that night in Marcanti Plaza in Amsterdam. ‘All preparations and our participation in the Song contest and our anniversary concerts in the ArenA are putting a high pressure on our agenda’s. Some people have booked us months ago for performances and it is not appropriate to cancel those’ so The Toppers said. However, crowd seemed to enjoy performances of other 20 Eurovision contestants throughoutly. You can also watch video report of De Telegraaf here and of ShowNiews here. More videos are available on promotours page В субботу 18го апреля, The Toppers поприветствовали 21 европейскую делегацию из стран, принимающих участие в Евровидении 2009. Сначала в субботу певцов и музыкальные группы встречала Гаага. У входа в "Новую церковь" напротив городской ратуши их встретили заместитель бургомистра Фритс Хюффнахел (Frits Huffnagel) и члены группы The Toppers, которая будет представлять Нидерланды в Москве. "Для нас невероятно большая честь выступать в Москве, - сказал РИА Новости Йероен ван дер Боом. - Узнав, что мы будем представлять там Нидерланды, мы сказали друг другу: "Какое счастье нам привалило - поехать на конкурс в этот прекрасный город". Для нас это - настоящая мечта, и мы с нетерпением ждем ее осуществления. В Москве мы выступим с песней "Shine", в которой поется о дружбе, радости и веселье. По-моему, это - самое важное и в жизни, и на песенном фестивале. Конечно, мы рассчитываем на успех в Москве, но в конкурсе будут принимать участие много сильных исполнителей, что замечательно, и победа не столь важна. Главное, мы уверены, что получим огромное удовольствие от выступления в Москве. Какое место мы займем, зависит от голосования, и мы надеемся, что зрители и слушатели будут доброжелательно настроены по отношению к нам". "Мы будем наслаждаться нашим пребыванием в Москве, куда привезем с собой позитивный настрой и попытаемся передать его слушателям, - сказал, в свою очередь Рене Фрогер. - Основная мысль песни "Shine", с которой мы выступим: во времена тревоги и отчаяния будьте источником любви и света, помогайте другим людям. Если мы будем подходить к решению существующих в мире проблем с открытостью и позитивным настроем, то вместе мы сможем решить очень многие из них". Фрогер сообщил, что The Toppers сейчас много репетируют, чтобы хорошо выступить на "Евровидении", готовят к нему новые костюмы. "Главное же будет происходить в Москве, - отметил он. - Многие участники конкурса являются кандидатами на звание победителя. Среди них представители России, Норвегии, Великобритании, Испании и других стран". Певица из Великобритании Джейд сказала РИА Новости, что ожидает захватывающего зрелища от "Евровидения" в Москве. "Я держу в секрете особенности моего выступления в российской столице и могу лишь сказать, что вместе с моими партнерами я усиленно готовлюсь к нему: мы много репетируем, работаем над постановкой нашего шоу, одеждой и реквизитом". После приветствия бургомистра собравшимся участникам конкурса и пресс-конференции, привлекшей многочисленных журналистов со всей Европы, группа The Toppers исполнила песню Shine. Затем все участники на трех открытых автобусах совершили поездку по Гааге. Вдоль всего пути их приветствовали жители города и туристы. На одной из центральных площадей напротив парламента процессия сделала остановку для общения с собравшейся там публикой. Голландская группа прямо с автобуса вновь исполнила свою конкурсную песню, встреченную бурными аплодисментами. Конечным пунктом маршрута был всемирно известный музей под открытым небом "Мадюродам", в котором представлены самые знаменитые здания и сооружения Нидерландов в уменьшенном виде - 1:25. Участники "Евровидения" имели возможность осмотреть экспозицию и сфотографироваться на память. Они также давали интервью журналистам, которые, пользуясь случаем, снимали знаменитых певцов и музыкантов на фоне мастерски выполненных миниатюрных макетов. Пришедшие в "Мадюродам" туристы не преминули перемолвиться словом со знаменитостями и попросить у них автографы. В субботу вечером и в ночь на воскресенье собравшиеся в Нидерландах участники московского "Евровидения" из 21 страны дали четырехчасовой концерт в амстердамском зале "Марканти" (Marcanti), вмещающем 2 тысячи зрителей. Некоторые участники, не успевшие приехать днем в Гаагу из Лондона, где они выступали в ночь с пятницы на субботу, прибыли сразу на концерт в Амстердам. Из-за других обязанностей группа The Toppers не смогла принять участие в этом. "Вся наша подготовка, участие в Евровидении и юбилейные концерты в ArenA накладывают на нас большое давление. К сожалению, на этот день уже было запланировано появление группы в телепрограмме и отменить его было бы неправильным", заявили участники группы. Однако, публика смогла получить удовольствие от выступления других 20 конкурсантов Евровидения. Вы также можете посмотреть видео репортаж De Telegraaf здесь и ShowNiews здесь. Другие видеозаписи и репортажи - страница промо-туров. Special party “To the Top with the Toppers” has been announced for May 11th in Moscow. The event will be hosted by: Alexander Anatolievich from MTV Russia and Dutch tenor and presenter, Kees Taal. This event will take place in MDM in Moscow, venue known for hosting many famous musicals, and besides press, regular visitors may attend it purchasing tickets with percentage from the sales going to the charity. Live performances from the cast of “Mamma Mia” and “Beauty and the Beast”, and “The Toppers” including “Shine” - the entry for the Eurovision Song Contest 2009! Also, trendy sets from Dutch DJ Perry Stuiver and Russian DJ Fema! Glamourous party with an exquisite mix of Dutch and Russian food and beverages! Объявлено о проведении в Москве 11го мая специальной вечеринки “To the Top with the Toppers”. Ее ведущими станут виджей MTV Россия Александр Анатольевич и голландский тенор и ведущий Кеес Таал. Вечеринка пройдет в Московском Дворце Молодежи, и помимо прессы на нее смогут попасть и другие поклонники группы, приобревшие билеты. Часть от прибыли пойдет на благотворительные цели. Пришедших ждут живые выступления трупп мюзиклов "Mamma Mia" и "Красавица и чудовище", и, конечно же выступление самих De Toppers. Также свои сеты исполнят диджеи Перри Стуйвер и Фема. Вас ждет гламурная вечеринка со смесью голландской и русской кухни и напитков. Starting 19th of March, every Thursday at 22.20 Netherlands 1 will broadcast documentary devoted to The Toppers participation in the Euroivision contest. First episode is devoted to the early story from last year from inclusion of Jeroen as new member to the selection of songs for the festival. Second episode is devoted to the national final and John Marks remix creation. Third episode is available here. Fourth episode is available here. All episodes are also available here. Meanwhile, De Toppers have appeared as guests of X-Factor show and you can watch their live performance of Shine here. Video from show Bananasplit is available here. 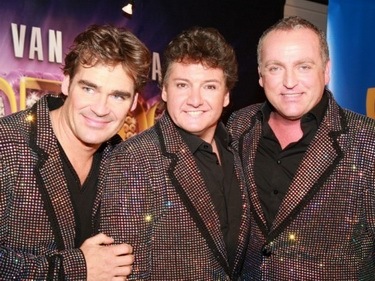 On Saturday, April 4th De Toppers have appeared in TROS Muziekcafe concert. Watch videos here. Начиная с 19го марта, каждый четверг в 22.20 телеканал Nederland 1 будет транслировать документальный сериал, посвященный подготовке The Toppers к Евровидению. Первый эпизод будет посвящен событиям прошлого года, начиная с включения Йероена в состав группы и до выбора песен для фестиваля. Второй эпизод посвящен национальному отбору и созданию ремикса Джона Маркса. Третий эпизод доступен здесь. Четвертый эпизод доступен здесь. Все эпизоды также доступны здесь. Тем временем, De Toppers приняли участие в шоу X-Factor в качестве гостей, и вы можете посмотреть живое исполнение песни Shine здесь. Видео из еще одной телепрограммы, Bananasplit, доступно здесь. В субботу, 4го апреля, De Toppers приняли участие в концерте TROS Muziekcafe. Видео из него можно увидеть здесь. 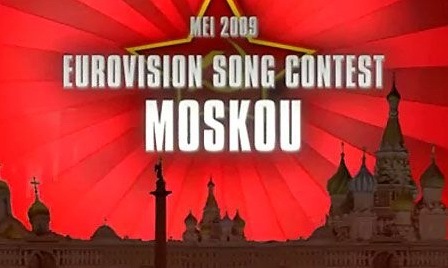 13/03 The definite version of the Dutch entry for the Eurovision Song Contest 2009 in Moscow has been released today. The Toppers commissioned famous DJ John Marks to produce new remixes of their song ‘Shine’ which was written by fellow Topper Gordon Heuckeroth. 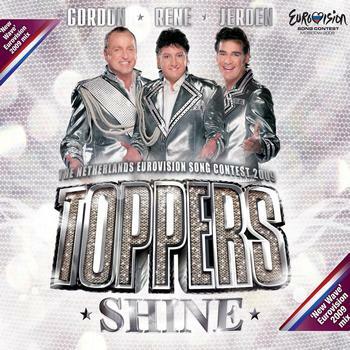 This May The Toppers will compete, at the biggest musical event in the world, with their Shine ‘New Wave’ Eurovision 2009 Mix. John Marks (John Dirne) was born in 1981 and finished his musical education in 2001 at the Dutch Academy of Music. After he produced numerous Top 100 hit singles he started his own record label in 2002 by the name White Villa and as DJ John Marks he found his way in dance-music. John Marks became an instant phenomenon in the national and international club and dance scene as (co)producer, DJ and record label for famous artists such as Guru Josh Project, Shaggy, Akon, Tom Novy, Alcazar, Agnes, DJ Jean, DJ Jurgen, Mental Theo and many more. He scored massive hit songs with ‘Tracking’, ‘Don’t Stop’ and ‘Do it Again’ but he gained world wide recognition with his hit singles “Carnival’ and ‘Insanity’. DJ John Marks still does numerous gigs in Poland, Russia, Spain and Greece and is known to be an absolute ‘floorfiller’. In February John Marks wowed The Toppers with his own club-remix of their song ‘Shine’. The Toppers and their staff were thrilled by this remix and invited John Marks to produce the definite Eurovision Song Contest entry of ‘Shine’. A couple of years ago John already produced a remix for The Toppers. 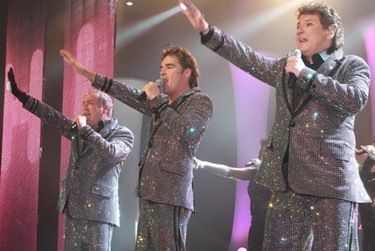 ‘Can you feel It’ was used as the opening track of Toppers in Concert 2007. The Shine ‘New Wave’ Eurovision 2009 Mix combines a typical modern day dance-beat, a happy and catchy melody and a positive message to the world. A unique extended version is made specifically for the (dance)club scene throughout Europe. Furthermore a spectacular music video was produced last week. ‘Now that the song and the music video of ‘Shine’ is completed we can focus on doing publicity throughout Europe and on the dazzling show we want to put on in Moscow’ so The Toppers say. 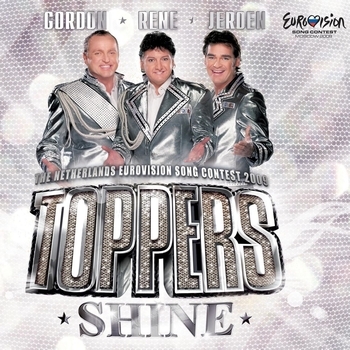 Specifically for the Eurovision Song Contest 2009 The Toppers launched a new international website. On their site www.topperseurovision.com you can find the latest news surrounding The Toppers and their road to Moscow! You can purchase online version of Toppers single insluding New Wave Eurovision mix, New Wave Extended Mix and Old Skool Mix here, also on 7digital and iTunes Окончательная версия голландской песни для конкурса Евровидение 2009 была выпущена сегодня. Ее продюсером стал известный диджей Джон Маркс, который по приглашению группы The Toppers подготовил новые ремиксы песни "Shine", написанной участником группы Гордоном. В мае этого года The Toppers исполнят на крупнейшем музыкальном событии в мире Shine "New Wave" Eurovision 2009 Mix. Джон Маркс (Джон Дирн) родился в 1981 году. В 2001 году он закончил голландскую музыкальную академию. После этого он спродюсировал множество хит синглов, входивших в топ 100 национального чарта, и в 2002 году открыл собственный лейбл под названием White Villa и в качестве DJ John Marks приобрел известность в мире танцевальной музыки. Джон становится (со)продюсером, диджеем и руководителем лейбла для таких известных артистов, как Guru Josh Project, Shaggy, Akon, Tom Novy, Alcazar, Agnes, DJ Jean, DJ Jurgen, Mental Theo. Среди его хитов композиции ‘Tracking’, ‘Don’t Stop’ и ‘Do it Again’, а мировое признание пришло к нему после выпуска синглов “Carnival’ и ‘Insanity’. DJ John Marks регулярно выступает на площадках в Польше, России, Испании и Греции. В феврале Джону Марксу очень понравилась песня The Toppers "Shine" и он сделал на нее клубный ремикс. The Toppers и их команда были поражены им и пригласили Джона для продюсирования окончательной конкурсной версии "Shine". Два года назад Джон уже работал с The Toppers над композицией "Can you feel it", которая открывала концерт группы в 2007 году. Shine 'New Wave' Eurovision 2009 Mix объединяет в себе типичный современный танцевальный бит, радостную и запоминающуюся мелодию и позитивный мессадж всему миру. Уникальная удлиненная версия сделана специально для клубной сцены по Европе. На прошлой неделе также было закончен видеоклип на песню. "Теперь, после того как песня и видеоклип на Shine готовы, мы можем сфокусироваться на рекламе по всей Европе и на невероятном шоу, которое мы хотим показать в Москве", говорят участники группы. Специально для конкурса Евровидение они запустили новый международный вебсайт. На сайте www.topperseurovision.com вы можете найти все свежие новости о подготовке группы к Евровидению. DJ John Marks is behind the new version of Dutch Eurovision 2009 entry. The Toppers will present the new and definite version - audio and video - of the Dutch entry for the Eurovision Songcontest 2009, the SHINE ‘NEW WAVE’ EUROVISION 2009 MIX this Friday (13 March). Meanwhile, a unique extended version will be made specifically for the (dance)club scene throughout Europe. An audio sample of The Shine ‘New Wave’ Extended Club Remix’ can now be previewed on YouTube. Известный мировой диджей John Marks стал автором новой аранжировки песни Нидерландов на Евровидении 2009. De Toppers презентуют окончательную версию своей конкурсной песни Shine 'New Wave" Eurovision 2009 Mix в эту пятницу (13го марта). Тем временем, также готова уникальная удлиненная версия композиции, предназначенная специально для исполнения в клубах по всей Европе. Сэмпл Shine 'New Wave' Extended Club Remix можно прослушать на Youtube. 24/02 Right after the Dutch audience choose the song ‘Shine’ to become the Dutch entry for Moscow, The Toppers and their staff had started preparations for the final production of the winning song and about their act in general. They stumbled upon a special dance club remix of the song ‘Shine’ which was made by one of the most renowned DJ’s in the international club scene. This DJ is responsible for numerous number 1 dance-hits and world famous ‘floor fillers’. The Toppers and their staff were thrilled by this remix and they invited him to produce the definite Eurovision Songcontest entry of ‘Shine’. The ‘Shine New Wave Eurovision 2009 Mix’ will be produced as a radio edit, which The Toppers will perform during the semi-finals and hopefully during the finals in Moscow. And a special extended version will be made especially for the (dance)club scene throughout Europe. The European release of the remixes and the video are planned on 13th March. This is also the day that the new Toppers site will be launched. Сразу после того, как зрители Нидерландов выбрали песню "Shine" в качестве представителя страны на Евровидении 2009, группа De Toppers и ее команда начали думать о подготовке финальной версии композиции и выступлении группы в общем. Они случайно наткнулись на dance club remix песни "Shine", который сделал один из самых известных ди-джеев на международной клубной сцене. Этот DJ является автором многочисленных танцевальных хитов, возглавлявших различные чарты. De Toppers и их команда были поражены этим ремиксом и предложили DJю записать и финальную версию песни "Shine" для Евровидения. "Shine New Wave Eurovision 2009 Mix" будет также выпущен в качестве радио-версии, которую группа и исполнит в полуфинале, и, возможно в финале конкурса в Москве. Специальная, удлиненная версия, будет выпущена для использования в клубах по всей Европе. Релиз этих ремиксов, а также видеоклипа на песню запланирован на 13е марта. В этот же день откроется и новый сайт группы. After the final, there was some criticism from Dutch press regarding the fact that songs have not been performed 100% live during the preselection. "There was extraordinary interest towards the show in the whole Europe, a lot of critics and journalists have been watching it on TV and via internet. Thus, we didn't want to take ex unnecessary risks. The task was to choose the right song first of all. Thus, indeed we've decided to support 2nd and 3rd vocals by playback, however leaving lead vocal always live. We will not have any problems with live performance in Moscow, we still have several monthes to polish it", said Topper Jeroen van der Boom. Answering all critics, the trio has recorded completely live version with a piano accomaniment, which can be watched here. После финала в адрес группы раздался определенный критицизм со стороны голландской прессы за не 100% живое исполнение песен на отборе. "К этому шоу было приковано внимание всей Европы, многие журналисты и критики следили за ним по ТВ и интернету. Поэтому, мы решили не брать на себя ненужные риски. Важно было выбрать прежде всего правильную песню. Поэтому, мы решили поддержать 2й и 3й вокал фонограммой, однако основной вокал всегда звучал вживую. Никаких проблем с живым исполнением в Москве у нас не возникнет, ведь к тому же, впереди еще несколько месяцев подготовки", отметил Топпер Йероен де Бом. В ответ всем критикам трио записало полностью живое исполнение песни под аккомпанимент фортепиано, которое вы можете увидеть здесь. 25/01 Change of Eurovision broadcaster for Netherlands for 2010-2012. TROS will take over from NOS as participant of Eurovision Song Contest, reports Telegraaf. Prior to 2006 TROS was organizer of the national preselections, but as broadcast role was with NOS, TROS has pulled from the organization of the show. NOS briefly cooperated with other broadcaster, VARA for the next selection. TROS again organizers this year preselection and will broadcast De Toppers reality soap starting from March 19th. TROS is also representing The Netherlands in Eurovision Dance Contest, where it has chosen singer Thomas Berge to be their representative this year. In Junior Eurovision country is represented by yet another broadcaster, AVRO. Смена вещателя Евровидения в Нидерландах в 2010-2012 годах. Право на показ конкурса переходит к телеканалу TROS от телеканала NOS. До 2006 года TROS был организатором национального отбора, но, поскольку роль основного вещателя всегда была за NOS, TROS решил выйти из организации шоу. Далее NOS кратко сотрудничал с другим телеканалом, VARA, над организацией отбора. В этом году, TROS снова отвечает за организацию отбора и будет транслировать реалити шоу De Toppers начиная с 19го марта. TROS также представлет Нидерланды на Танцевальном Евровидении, выставив в прошлом году на него певца Томаса Берге. На Детском Евровидении страну представляет еще одна телекомпания - AVRO. De Toppers have visited show Life and Cooking on RTL 4 channel where they have performed very short samples of all 6 songs. You can watch videos from this show here. De Toppers посеттили шоу Life & Cooking на канале RTL 4, где исполнили короткие отрывки всех 6 песен. Вы можете посмотриеть видео с этого шоу здесь. List of the songs, to be performed by the trio De Toppers at the Dutch national selection on 1st of February, has been revealed. "Three Is The Magic Number" by Kees Tel and Christiaan Hulsebos. To give all songs a fair chance it was decided not to promote the songs prior to the National Final. 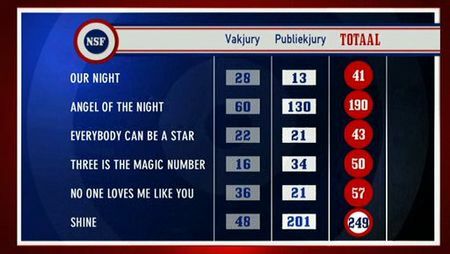 The jury will decice 1/3 of the outcome, while televoters 2/3. Members of jury are actress and singer Tatjana Simic, TROS radio presenter Daniel Dekker, writer and producer Emile Hartkamp, Getty Kaspers (Teach-In) and DJ Tony Berk. First part of the show will be broadcasted on 1st of February at 20.25 CET on Nederland 1 and streamed online at songfestival.nl. The result will follow at 22.20 CET. On satellite channel BVN first part will start at 20.45 CET and second part at 23.35 CET. Also confirmed that Eurovision commentator will be Cornald Maas. Объявлен список песен, которые исполнит трио De Toppers на национальном голландском отборе, который состоится 1го февраля. Для того, чтобы дать равные шансы всем песням, было решено не раскручивать их до национального отбора. Жюри будет принадлежать 1/3 выбора, телезрителям - 2/3. Члены жюри: актриса и певица Татьяна Шимич, радио-ведущий TROS Даниель Деккер, автор и продюсер Эмили Харткамп, Гетти Касперс (Teach-In) и DJ Тони Берк. Первая часть шоу будет показана 1го февраля в 22.25 Москвы по каналу Nederland 1 и онлайн на сайте songfestival.nl. Результаты последуют в 00.20 Москвы. На спутниковом канале BVN первая часть будет показана в 22.45 Москвы, вторая часть в 01.35 Москвы. Также, подтверждено, что комментатором Евровидения станет Корнальд Маас. 10/12 Dutch Nationaal Songfestival 2009 will take place on February 1 at Studio 22 in Hilversum. During the show band De Toppers will perform 6 songs, and the winner will be selected via televoting and jury vote of Dutch 12 provincies. Presenter of the national final will be Jack van Gelder. 6 participating entries have been chosen by the band members from 365 entries received by NOS broadcaster. 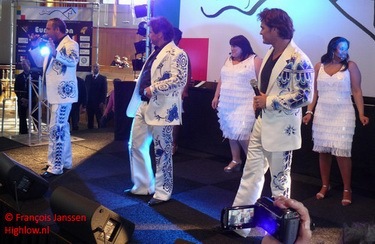 Today band has also relaunched their site www.toppersinconcert.nl. There you can find additional information about De Toppers tour 2009 and their participation in Eurovision Song Contest. Национальный голландский отбор состоится 1го февраля в студии 22 в Хилверсуме. Во время шоу группа De Toppers исполнит 6 песен и победитель будет выбран во время телеголосования и голосования жюри 12 голландских провинций. Ведущим шоу будет Як ван Гелдер. 6 участвующих песен были выбраны исполнителями из числе 365 заявок, полученных телекомпанией NOS. 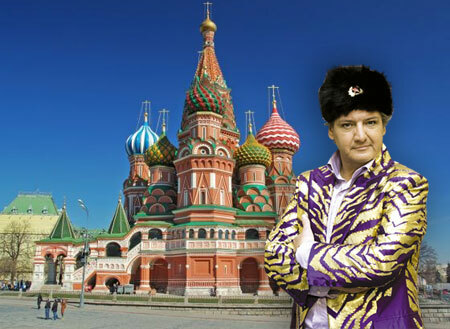 Группа также перезапустила свой сайт www.toppersinconcert.nl. На нем вы сможете найти дополнительную информацию о туре группы и участии ее в Евровидении. 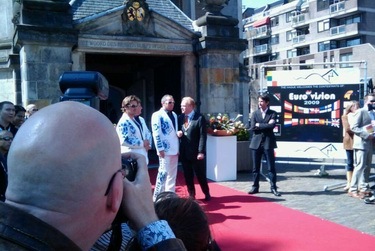 First Eurovision De Toppers' press conference was held at the Amstel hotel. 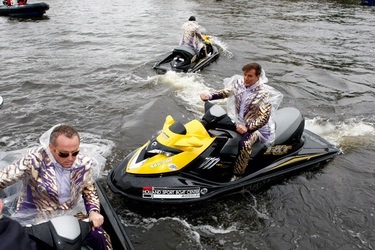 Gerard Joling, Gordon and Rene Froger arrived to the spot on jetskis. Dressed in purple suits with a poncho, along with a James Bond music and followed by police boat they came by bridge to the hotel and proceeded to the conference room. They've revealed that the news on their selection have reached them in July, but two members decided first not to tell news to Gerard, as he could have leaked news into press. It has been announced that national final will take place on February 1st and will be hosted by Jack van Gelder. De Toppers will perform 6 songs and televiewers along with jury will choose the one for Eurovision. De Toppers also stated their priority for a song in English instead of Dutch and for uptempo song instead of ballads. Also fashion designers have been invited to submit a design for the band outfit in Moscow. Right after the national final, Dutch broadcaster TROS will start a docu-soap called ‘De Toppers – On their way to Moscow’. De Toppers promised a lot of "glitter, glamour and drama" in Moscow. "We're pretty convinced we will put The Netherlands on The 'Eurovision-map' again. We want to make the Dutch people proud, so our goal is to win the contest. Lets face it: the Eurovision Song Contest lost its credibility in The Netherlands - at least people will watch it again in 2009! ", stated De Toppers. However, not everything went according to the schedule. 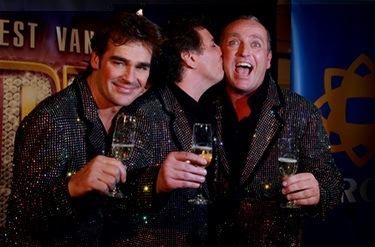 Gerard Joling and Gordon have gone public in a row over television contracts and a docu-soap. It has started with announcement of broadcaster SBS announced that they would not allow Gerard to take part in the soap to be aired on rival broadcaster TROS, as Gerard has an exclusive contract with SBS. While two channels tried to reach an agreement, the row has started between the members of the band itself. Gordon has publicly accused Gerard, stating "Gerard has to show some balls! His contract is based on his activities as a presenter, not as a singer. The docusoap is all about his singing career". Gerard hit back saying "All fingers are pointing to me; I seem to be the one to blame and that’s not fair. As for Gordon, it’s always the same story and I’m done with it. In the past, he has been saying things about me as well in the media. Everytime I confront him with these stories, he tells me he didn’t say things the way they were published. I’m really fed up with all this and I withdrawing from the whole project. In that case Gordon and Rene can go to Moscow together. This Eurovision participation seems to be very important to Gordon, but for me it’s all about fun. Besides that, I’m not calling for work; my agenda is loaded!". After singers publicly exchanged opinions, on November 9th Gerard Joling announced submitting a withdrawal letter to NOS stating "No Eurovision and no concerts in June for me. You can not do one and leave the other". 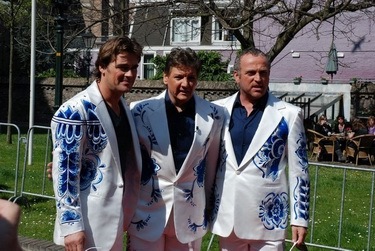 The management of De Toppers blamed Gerard Joling for abandoning the project, stating "To reduce any further damage, an emergency meeting was planned last weekend. We made several deals about the fifth anniversary of De Toppers in 2009 and we want to live up to that. Therefore we need to come up with a clear point of view on this matter. We can’t disappoint the hundred thousands of fans by cancelling our anniversary concerts in June. That’s why we discussed the option to ask another artist to replace Gerard". The very next day it was announced that he will be replaced in the band by Jeroen van der Boom. "I have enormous respect for what Gerard has done but I will try to do my own contribution to this unique concept", commented new member of the band. Первая пресс-конференция De Toppers прошла в Амстердамском Amstel отеле. Герард Йолинг, Гордон и Рене Фрогер прибыли к месту проведения на джетскаях. Одетые в пурпурные костюмы с пончо в сопровождении музыки из серии про Джеймса Бонда они по мостику вышли на берег и проследовали в зал для конференций. Они сообщили собравшимся, что новости об их утверждении для Евровидения достигли их в июле, но два члена группы долгое время ничего не говорили Герарду из-за боязни, что он может слить информацию в прессу. Было объявлено, что финал национального отбор пройдет 1го февраля, его ведущим станет Як ван Гелдер. Де Топперс исполнят 6 песен и телезрители совместно с жюри выберут одну из них для Евровидения. De Toppers также заявили о то, что они предпочли бы быстротемповые композиции, а не баллады, а также песни на английском, а не голландском. Они призвали модельеров также подавать им свои идеи дизайна костюмов для Москвы. Было объявлено о том, что сразу после национального отбора телеканал TROS начнет трансляцию документальной мыльной оперы "De Toppers по дороге в Москву". Группа обещала, что в Москве всех ждут "Блестки, гламур и драма". "Мы уверены в том, что сможем снова нанести Нидерланды на карту Евровидения. Мы хотим, чтобы голландцы гордились нами, наша задача - победить на конкурсе. Давайте признаем, в Голландии Евровидение потеряло свой авторитет - и как минимум, наше участие должно вернуть к нему зрителей! ", заявили участники группы. Однако, не все пошло по расписанию. Гордон и Герард Йолинг публично разругались по вопросу съемок документального сериала. Все началось с заявления телеканала SBS о том, что они не разрешают Герарду сниматься в этом сериале, который должен выйти на конкурирующей телекомпании TROS, поскольку у Йолинга подписан эксклюзивный контракт с SBS. Пока два канала пытались достичь соглашения, рассорились сами участники группы. Гордон публично обвинил Герарда, заявив: "Герард должен перестать быть трусом! Его контракт говорит только о его деятельности как ведущего, но не исполнителя. А сериал будет исключительно о его песенной карьере". Герард ответил на это: "Все снова обвиняюит меня - и это не справедливо. Что же касается Гордона, то мне уже осточертело, что каждый раз повторяется одно и тоже. Он постоянно что-то говорит прессе против меня. Каждый раз, когда я ему задаю вопрос, он говорит, что его слова переврали и ничего подобного он не говорил. Я сыт этим по горло, и я выхожу из проекта. Пусть Гордон и Рене едут в Москву вдвоем. Участие в Евровидении видимо очень важно для Гордона - но для меня это просто развлечение. Помимо этого, я не ищу работы - у меня и так куча планов!". После этих публичных заявлений 9го ноября Герард отправил уведомление телеканалу NOS заявив: "Я выхожу из Евровидения и июньских концертов, поскольку они взаимосвязаны друг с другом". Менеджмент De Toppers обвинил Герарда в оставлении проекта и заявил: "Для того, чтобы предотвратить его полный распад, нам пришлось в прошлые выходные провести чрезвычайную встречу. Мы уже заключили контракты, касающиеся празднования 5й годовщины De Toppers и нам надо их исполнять. Мы не можем разочаровать сотни тысяч поклонников отменив юбилейные концерты в июне. Поэтому мы решили пригласить на место Герарда другого исполнителя". На следующий день было объявлено, что к группе присоединяется Йероен ван дер Боом. "Я очень ценю то, что делал Герард, но я постараюсь внести в концепцию свой собственный вклад", прокомментировал новый член группы.